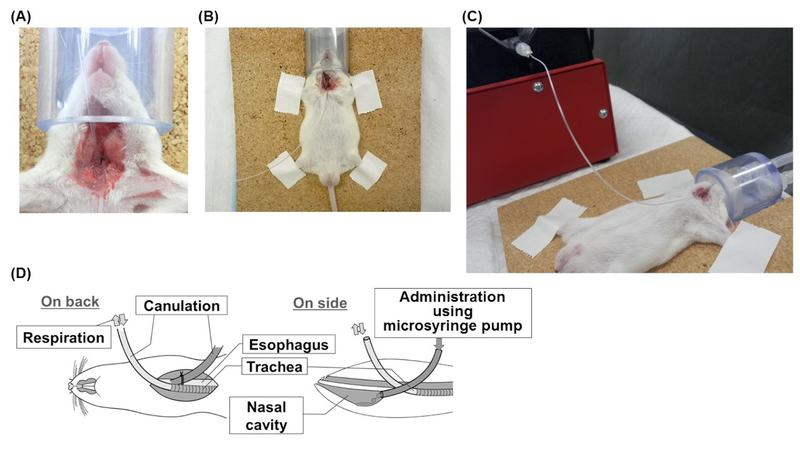 Here, we describe two novel methods of stable intranasal administration under inhalation anesthesia with minimal physical stress for experimental animals. We also describe a method for quantitative evaluation of drug distribution levels in the brain via the nose-to-brain pathway using radiolabeled [14C]-inulin as a model substrate of water-soluble macromolecules. Kanazawa, T., Fukuda, M., Suzuki, N., Suzuki, T. Novel Methods for Intranasal Administration Under Inhalation Anesthesia to Evaluate Nose-to-Brain Drug Delivery. J. Vis. Exp. (141), e58485, doi:10.3791/58485 (2018). Intranasal administration has been reported to be a potential pathway for nose-to-brain delivery of therapeutic agents that circumvents the blood-brain barrier. However, there have been few reports regarding not only the quantitative analysis but also optimal administration conditions and dosing regimens for investigations of nose-to-brain delivery. The limited progress in research on nose-to-brain pathway mechanisms using rodents represents a significant impediment in terms of designing nose-to-brain delivery systems for candidate drugs. 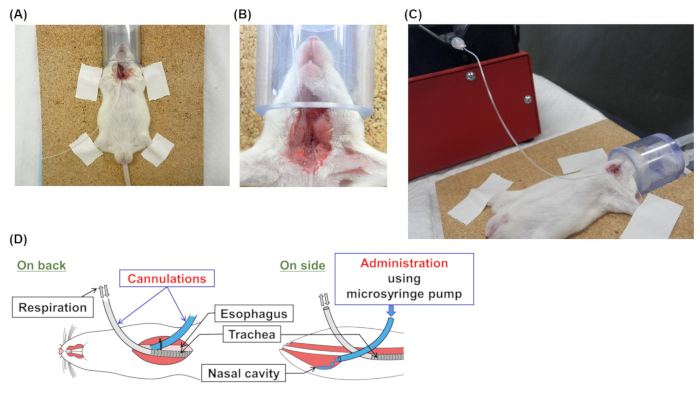 To gain some headway in this regard, we developed and evaluated two novel methods of stable intranasal administration under inhalation anesthesia for experimental animals. We also describe a method for the evaluation of drug distribution levels in the brain via the nose-to-brain pathway using radio-labeled [14C]-inulin (molecular weight: 5,000) as a model substrate of water-soluble macromolecules. Initially, we developed a pipette-based intranasal administration protocol using temporarily openable masks, which enabled us to perform reliable administration to animals under stable anesthesia. Using this system, [14C]-inulin could be delivered to the brain with little experimental error. We subsequently developed an intranasal administration protocol entailing reverse cannulation from the airway side through the esophagus, which was developed to minimize the effects of mucociliary clearance (MC). This technique led to significantly higher levels of [14C]-inulin, which was quantitatively detected in the olfactory bulb, cerebrum, and medulla oblongata, than the pipette method. This appears to be because retention of the drug solution in the nasal cavity was substantially increased by active administration using a syringe pump in a direction opposite to the MC into the nasal cavity. In conclusion, the two methods of intranasal administration developed in this study can be expected to be extremely useful techniques for evaluating pharmacokinetics in rodents. The reverse cannulation method, in particular, could be useful for evaluating the full potential of nose-to-brain delivery of drug candidates. Biomedicines such as peptides, oligonucleotides, and antibodies are considered to have potential application as novel therapeutic agents for refractory central nervous system disorders that currently have no curative therapy. However, because most biomedicines are water-soluble macromolecules, delivery from the blood into the brain via intravenous or oral administration is extremely difficult due to impedance of the blood-brain barrier (BBB). In recent years, intranasal administration has been reported to be a potential pathway for nose-to-brain delivery of therapeutic agents that avoids the BBB1,2,3,4,5. However, there have been relatively few reports regarding the quantitative analysis of nose-to-brain pathway delivery6. Moreover, there have been virtually no reports on established optimal administration conditions and dosing regimens, such as volume, times, time-periods, and speed, for investigations of nose-to-brain delivery. The aforementioned deficiencies can be ascribed to the following reasons: (i) an optimal method of intranasal administration for mice has yet to be established, and (ii) intranasal administration by pipetting, which is generally used, is typically characterized by interindividual variation among animals due to mucociliary clearance (MC), thereby often leading to underestimations of the actual nose-to-brain delivery potential of a particular drug. Inhalation anesthesia using isoflurane (initiation: 4%, maintenance: 2%) with an inhalation mask for rodents has gained widespread use, with the aim of reducing or eliminating the pain associated with surgery performed on experimental animals. The use of masks makes it relatively straightforward to perform typical drug administration in experimental animals under inhalation anesthesia via the subcutaneous, intraperitoneal, and intravenous routes. However, in the case of intranasal administration, the mask needs to be temporarily removed from the animals for drug administration. With maintenance under 2% isoflurane, animals typically awaken rapidly from inhalation anesthesia. When the administration volume per dose is large, this could cause the drug solution to flow from the nasal cavity into the esophagus, and therefore a single large dose may need to be broken down into multiple smaller doses for intranasal administration to small animals. As intranasal administration necessitates mask removal for repeated administration and sufficient time for sustained nasal cavity delivery, there is a high probability that mice would awaken from anesthesia during the administration procedure. This makes it very difficult to perform intranasal administration under a stable anesthetic state, and probably contributes to the observed interindividual variation of nose-to-brain delivery among rodents. In this study, we therefore developed two novel methods of stable intranasal administration under inhalation anesthesia, which impose minimal physical stress on the experimental animals. For the first method, we used a temporarily openable mask that enables intranasal administration during inhalation anesthesia. The openable part of the mask incorporates a silicone plug that can be used in accordance with administration timing to facilitate stable intranasal administration using a pipette. For the second method, a cannula was surgically inserted to pass from the esophagus into the nasal cavity, and a syringe pump was then attached to this so that the drug solution could be directly and reliably delivered into the nasal cavity under stable inhalation anesthesia. This method can enhance the delivery of drugs into the brain via the nose-to-brain route, because by substantially minimizing the effects of MC, drug retentively in the nasal cavity would be improved. In addition, we describe a method for quantitatively evaluating drug distribution levels (% for the injected dose/g brain) in the brain using radio-labeled [14C]-inulin [molecular weight (MW): 5,000] as a model substrate of water-soluble macromolecules. This animal study (#AP17P004) was performed in accordance with the guidelines approved by the Nihon University Animal Care and Use Committee (Tokyo, Japan). This study (#17-0001) was approved by the Radioisotope Center of the School of Pharmacy, Nihon University. House the experimental mice in stainless-steel cages under a 12-h light/dark cycle (light on 8:00 AM–8:00 PM), with a controlled temperature maintained at 23 ± 1°C, humidity of 50% ± 10%, and ad libitum access to food and water. Prior to experimentation, anesthetize the mice via inhalation of 2% isoflurane, following initiation at a concentration of 4%. Confirm the requisite level of anesthetization by checking for the disappearance of surface righting. Prepare an administration solution of [14C]-inulin (50 μM, 0.5 μCi/mL per mouse) by diluting in phosphate-buffered saline, and store at 4 °C until use. Fix mice in the supine position on a corkboard by taping their limbs under inhalation anesthesia with 2% isoflurane (Figure 1A). Administer a total volume of 25-μL administration solution to each mouse at 30-s intervals, via 1- to 2-μL doses alternatively administered into the left and right nostrils while the mice are fixed under inhalation anesthesia (Figure 1B and C). Fix mice in the supine position on a corkboard by taping their limbs under inhalation anesthesia with 2% isoflurane. Hair in the neck is shaved and prepped via betadine or chlorhexidine application followed by an alcohol rinse. Expose the trachea and esophagus by expanding the skin below the throat with forceps after making a small incision (1.5 cm) with scissors. Make an incision (1 mm) in the trachea using scissors. Insert a cannula (internal diameter: 0.58 mm, exterior diameter: 0.965 mm) to a length of 1.2 cm and attach the opposite end of the cannula to the inside of the inhalation mask. Make an incision (1 mm) in the esophagus using scissors, insert a cannula (internal diameter: 0.28 mm, exterior diameter: 0.61 mm) to a length of 1.4 cm toward the posterior part of the nasal cavity, and ligate it (Figure 2A and B). Note: Procedures 3.2.2 to 3.2.4 were carried out under a stereoscopic microscope at ×10 magnification. Attach a needle (27G × 1/2) to a 1-mL syringe filled with an administration solution and connect to a programmable micro-syringe pump. Connect above needle to the cannula that had been inserted into the esophagus at 3.2.5 (Figure 2C). Administer a total volume of 25 μL [14C]-inulin solution at a constant rate (5 μL/min) (Figure 2C and 2D). Decapitate the experimental mice under anesthesia and open up their craniums, using scissors and from the side of the medulla oblongata, while taking care not to damage the brains. Extract carefully the whole brain by scooping using a micro-spatula from cranium. Place a filter paper moistened with saline solution on a Petri dish that is stored on ice. Place the extracted brains on the moistened filter paper. Wipe off blood adhering to the surface of the brain with a cotton swab moistened with saline solution to eliminate at least the influence of [14C]-inulin in the blood on the surface of the brain. Dissect brains rapidly, and divide them into three parts: the olfactory bulb, cerebrum, and medulla oblongata (including the pons). Place brain samples in tissue solubilizer at 50 °C for 1 h.
Add 10 μL of the liquid scintillation cocktail to the brain samples. Transfer a 25 μL aliquot of the administration solution dissolved in scintillation cocktail to a scintillation vial to determine the radioactivity of the applied solution. Measure the disintegrations per minute of [14C] radioactivity in the brain sample ([14C] Xbrain) and the applied solution ([14C] XIN dose) in a liquid scintillation counter equipped with an appropriate crossover correction for 3H and 14C. where Xbrain (dpm/g brain) is the amount of [14C]-inulin measured in the brain tissue and XIN dose (dpm/25 μL solution) is the concentration of the [14C]-inulin in the solution used for intranasal administration. Figure 3 shows the [14C]-inulin levels (ID%⁄g brain) in the olfactory bulb (A), cerebrum (B), and medulla oblongata (C) obtained using the two types of intranasal administration assessed in the present study. Intranasal administration using the pipette method enabled delivery of [14C]-inulin into the brain using openable inhalation masks (Figure 1). Under inhalation anesthesia, the quantitative results revealed no experimental interindividual variation among the examined animals, as indicated by the low standard error. When the esophageal reverse cannula nasal cavity administration method was used to administer [14C]-inulin under inhalation anesthesia (Figure 2), significantly higher levels of [14C]-inulin were observed in the olfactory bulb (Figure 3A), cerebrum (Figure 3B), and medulla oblongata (Figure 3C), than with the pipette method. Moreover, within the brain, higher [14C]-inulin levels were detected in the olfactory bulb and medulla oblongata, which are prominently involved in the nose-to-brain pathway, than in the cerebrum. Figure 1: Intranasal administration using a micropipette in conjunction with a temporarily openable inhalation mask. Photographs showing a fixed mouse (A) with a closed mask before administration, and (B) close-up and (C) entire views of the opened mask during intranasal administration using a pipette. Please click here to view a larger version of this figure. Figure 2: Intranasal administration by reverse cannulation from the airway side through the esophagus using a syringe pump. Photographs showing (A) surgical area, (B) close-up and (C) entire views, and (D) scheme of a fixed mouse after two types of cannula had been inserted into the esophagus and trachea and connected to a micro-syringe in an inhalation mask. Please click here to view a larger version of this figure. Figure 3: Comparison of [14C]-inulin levels in the olfactory bulb (A), cerebrum (B), and medulla oblongata (C) following two types of intranasal administration. IN-A and IN-B indicate the micropipette method (Figure 1) and reverse cannulation method (Figure 2) for intranasal administration, respectively. Using each method, a total volume of 25 μL of [14C]-inulin (50 μM, 0.5 μCi/mL) was administered. The administration rate of IN-B was 5 μL/min. Each column represents the mean ± S.E. (n = 4). **p < 0.01 (Student's t-test) Please click here to view a larger version of this figure. The nose-to-brain delivery of drugs is expected to have a pronounced effect on central nervous system disorders because this pathway represents a direct transportation route that bypasses the BBB. Three different nose-to-brain pathways have been reported to date8. The first is the olfactory nerve pathway, which passes from the olfactory mucosa in the nasal mucosa to the forebrain via the olfactory nerve. The second is the trigeminal nerve pathway, which passes from the respiratory mucosa in the nasal mucosa to the brainstem in the hindbrain via the trigeminal nerve. The third is the CSF pathway, which is distributed throughout the brain via the CSF. The nose-to-brain pathway has attracted considerable attention with respect to the administration of hydrophilic macromolecules, which tend to be impeded by the BBB, and as a means of delivering biomedicines to the central nervous system8,9,10,11,12. However, few previous studies have clearly described methods of intranasal administration for small animals in order to verify the delivery of candidate drugs via the nose-to-brain pathway. Accordingly, there has been very slow progress in research related to nose-to-brain drug delivery mechanisms using small animals, which represents a significant impediment in terms of designing nose-to-brain delivery systems for candidate drugs. Therefore, in this study, we developed two protocols for intranasal administration under inhalation anesthesia to investigate the distribution of various candidate drugs, such as biomedicines, that target central nervous system diseases. We also described a method that can be used for quantitative evaluation. The method of intranasal administration by pipette using temporarily openable inhalation masks developed in this study makes it possible to perform reliable administration with animals in a state of stable anesthesia without awakening, as the masks do not have to be removed (Figure 1). Using this technique, we demonstrated the delivery of a water-soluble macromolecule (inulin; MW: 5,000) to the brain. As inulin does not penetrate the BBB, it can be used as a marker of intravascular volume space (approximately 10-15 μL/g brain) in the rat brain13. We obtained excellent quantitative results with little experimental error. The level of [14C]-inulin in the brain was clearly higher after intranasal administration than after intravenous administration (data not shown). Accordingly, we established that this technique represents a viable approach for intranasal administration that enables conventional administration using a pipette while the subjects remain under inhalation anesthesia (Figure 2). Inhalation anesthesia might affect the nasal epithelial membrane and, as a result, increase the permeability through the nasal epithelium. Further studies are required to characterize brain delivery using the reverse cannulation method under inhalation anesthesia, compared with conventional anesthesia such as intraperitoneal administration. We subsequently investigated administration via reverse cannulation from the airway side through the esophagus, which was developed to minimize the effects of MC. In rats, Hirai's method requires surgery to close the esophagus and then to administer from the entrance to the nose to minimize the MC effect. In mice, it is physically difficult to perform cannulation from the entrance of the nose, and intranasal administration may cause sneezing. Our reverse cannulation method connects the cannula directly inserted into the nasal cavity from the esophagus to a micro-syringe pump, which has the advantage that it is possible to close the esophagus and airway by surgery and simultaneously perform intranasal administration. Adjustment of the micro-syringe pump facilitates administration using precise dosing rates and volumes. Using this technique, we recorded significantly higher levels of the administered hydrophilic macromolecules in the olfactory bulb, cerebrum, and medulla oblongata of mice than when using the pipette method (Figure 3). This appears to be because with intranasal administration using a pipette, the solution is passively administered in accordance with spontaneous respiration, such that the solution tends to be eliminated toward the trachea and esophagus by MC. In contrast, with administration into the nasal cavity through an esophageal reverse cannula, the solution is administered actively using a syringe pump into the nasal cavity. It appears that this approach substantially increases the retention of the drug solution in the nasal cavity, leading to a higher distribution levels in the brain. Furthermore, we detected higher levels of the administered solution in the olfactory bulb and medulla oblongata, which are prominently involved in the nose-to-brain pathway, than in the cerebrum. Accordingly, we demonstrated that administration into the nasal cavity through an esophageal reverse cannula is a viable method for evaluating the full potential of the nose-to-brain delivery of drug candidates. In conclusion, the two methods of intranasal administration that we developed in this study can be expected to be extremely useful techniques for evaluating pharmacokinetics in small animals via the nose-to-brain pathway. This study was supported in part by the Private University Research Branding Project from MEXT; a Grant-in-Aid for Scientific Research (C) (17K08249 [to T.K. and T.S.]) from the Japan Society for the Promotion of Science (JSPS); a grant for cooperative research from the Hamaguchi Foundation for the Advancement of Biochemistry [to T.S. ], and the Takeda Science Foundation [to T.K.]. We thank Mr. Yuya Nito and Ms. Akiko Asami for their valuable technical assistance in conducting the experiments. Sakane, T., Yamashita, S., Yata, N., Sezaki, H. Transnasal delivery of 5-fluorouracil to the brain in the rat. Journal of Drug Targeting. 7, (3), 233-240 (1999). Illum, L. Transport of drugs from the nasal cavity to the central nervous system. European Journal of Pharmaceutical Science. 11, (1), 1-18 (2000). Hanson, L. R., Frey, W. H. 2nd Intranasal delivery bypasses the blood-brain barrier to target therapeutic agents to the central nervous system and treat neurodegenerative disease. BMC Neuroscience. 9, (Suppl 3), S5 (2008). Chapman, C. D., et al. Intranasal treatment of central nervous system dysfunction in humans. Pharmaceutical Research. 30, (10), 2475-2484 (2012). Kanazawa, T. Development of non-invasive drug delivery system to the brain for brain diseases therapy. Yakugaku-Zasshi. 138, (4), 443-450 (2018). Kozlovskaya, L., Abou-Kaoud, M., Stepensky, D. Quantitative analysis of drug delivery to the brain via nasal route. Journal of Controlled Release. 189, 133-140 (2014). Hirai, S., Yashiki, T., Matsuzawa, T., Mima, H. Absorption of drugs from the nasal mucosa of rat. International Journal of Pharmaceutics. 7, (4), 317-325 (1981). Lochhead, J. J., Thorne, R. G. Intranasal delivery of biologics to the central nervous system. Advances in Drug Delivery Reviews. 64, (7), 614-628 (2011). Lalatsa, A., Schatzlein, A. G., Stepensky, D. Strategies to deliver peptide drugs to the brain. Molecular Pharmaceutics. 11, (4), 1081-1093 (2014). Kanazawa, T. Brain delivery of small interfering ribonucleic acid and drugs through intranasal administration with nano-sized polymer micelles. Medical Devices. 8, 57-64 (2015). Kanazawa, T., et al. Enhancement of nose-to-brain delivery of hydrophilic macromolecules with stearate- or polyethylene glycol-modified arginine-rich peptide. International Journal of Pharmacology. 530, (1-2), 195-200 (2017). Kamei, N., et al. Effect of an enhanced nose-to-brain delivery of insulin on mild and progressive memory loss in the senescence-accelerated mouse. Molecular Pharmaceutics. 14, (3), 916-927 (2017). Suzuki, T., Oshimi, M., Tomono, K., Hanano, M., Watanabe, J. Investigation of transport mechanism of pentazocine across the blood-brain barrier using the in situ rat brain perfusion technique. Journal of Pharmaceutical Science. 91, (11), 2346-2353 (2002).